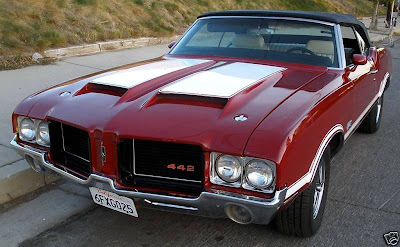 It's hard to believe now, as one of the brands is long gone and the other just got the ax, but two of the most exciting cars built in America in the 1960s and early 1970s came from the Oldsmobile and Pontiac divisions of General Motors. In 1964 the 442 was Oldsmobile's answer to the Pontiac GTO. Like the GTO, it started life as an option package, the "B09 Police Apprehender" option, but soon became a model in its own right. The 1964 442 had a 330 ci V8 and 442 stood for 4-barrel carburetor, 4-speed transmission, and 2 exhausts. The next year it got a 400 cu V8 and 442 took on the meaning most of us know; 400 cubic inches, 4-barrel carburetor, 2 exhausts. Like the GTO, the 442 is straight line fast. While Oldsmobile did the best it could to improve the handling, this is not a car meant for twisting mountain roads. This is a car that is meant for the highway. 0-60 comes in under 9 seconds, which is impressive for an old car of this size. The car shown above is not a matching numbers trailer queen. It's a rebuilt 442 using some of the best bits available. It's a summer driver. It is, in my eyes, drop dead gorgeous. The color combination, the wheels, the stripes, everything about this car is just "right". As you may have figured out, my personal taste runs towards smaller European cars. Still, I have to appreciate the 442 for what it is. Besides being a beautiful, fast car, it represents a time when the US Big 3 automakers (and even AMC) used their skills to make desirable cars, not - like now - undesirable car-like appliances. It represents a time when the US automakers had pride. I don't know how often I'd drive it, but if I had the giant driveway and bank account balance that I so often fantasize about, I'd buy this car. Click here to see the eBay listing for this 1972 Olds 442. It's a well done ad with a lot of clear photos. Click here to find 442.com. Click here to find the Muscle Car Club feature on the 442. You find some of the best old cars!